Silica gel are material that popular for photographer to keep the box not to humid, to prevent some mushroom live on the lens. 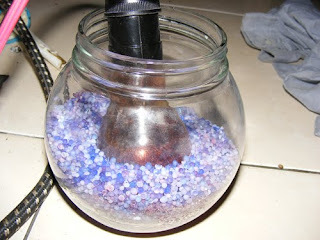 It turn form dark blue to pink when it absorb water. When it turn to pink, its time to change the silica gel. 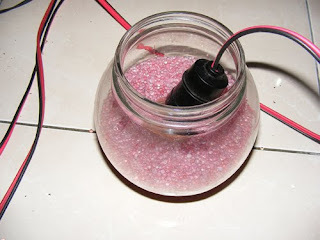 Many people said the pink silica gel can be recycled into blue again with heat. At Fist time, I wondering should I recycled my used silica gel or not, since it not an expensive material. But it’s a DIY project. Why don’t I do that?. I have read about recycling silica gel using a fry it on stove with pan, I ve tried it, but it crack easily and turn the silica gel into small pieces. But it turned blue anyway, mean it already recycled. Somebody said put it on oven. I still need my oven for my food. I won’t do that. I guess the crack on silica gel was made by sudden heat on pan,While each silica gel contained full of water. So it need an even and balance heat like oven. 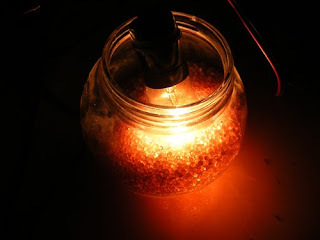 My idea turn on heat of tungsten lamp. Yes it hot. If you use 150 watt or above, it is very hot. I like to use this lamp for drying my negative film. So just put the 150watt tungsten lamp on the box, can or anything that can handle the heat. In my case I use a glass jar. Just leave it for 3 hour, or maybe less, Since I forget about my experiment an leave it for 3 hours for another activity, and when i back, the silica gel were turned blue. this is the result of half an hour 150watt tungsten lamp. the last result i forget to take a picture. my hand got burned. Success, but with some bad experience, I got small burned on my finger. I stupidly sunk my hand on the hot silica gel, it really hot guys .. wait until it cold and re use again. kalo dijemur dimatahari aja gimana gan?